From Middle English, from Old English lifer, from Proto-Germanic *librō. Cognate with Dutch lever, German Leber, Danish, Norwegian and Swedish lever (the last three from Old Norse lifr). 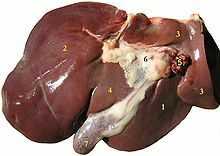 Of the colour of liver (dark brown, tinted with red and gray).